US, 1980, 110 minutes, Colour. Clint Eastwood, Sondra Locke, Geoffrey Lewis, Ruth Gordon, William Smith. Directed by Buddy Van Horn. Any Which Way You Can makes about as much grammatical sense as the original Every Which Way But Loose. However, it is as much a money-maker as the original. This sequel is not so much a sequel as a repeat of the popular formula. 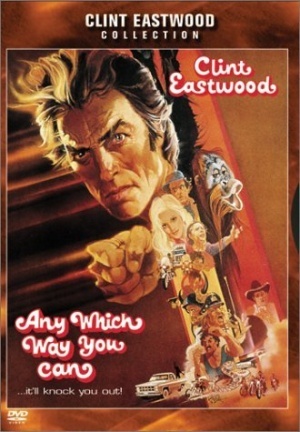 The differences are that Clint Eastwood now looks older but still fights a tough fistfight. Sondra Locke stays sweet this time and Ruth Gordon's Ma has moderated her language a little and actually does drive. Orang-utan Clyde has almost as large a role as Clint. The humour is very broad indeed and very basic American knockabout heroic stuff aimed at the widest possible audience. The ageing bikies are also back ? and even a little sweeter. There is a lot of musical accompaniment including Clint Eastwood and Ray Charles singing during the credits, guest appearances by Fats Domino and Glen Campbell. The American themes that were present in the original are repeated here ? the ordinary American heroes, extroverts and tough; the use of cars, chases, macho images of toughness to the final fight in Wyoming with its large betting backing, even from national American syndicates. One could add, non-extroverts beware.